STAMFORD, CT, US, August 30, 2018 /EINPresswire.com/ -- Fairfield County and the German School of Connecticut are well-represented this year: by the newly crowned Miss German-America 2018 and Her Court of Princesses who live, work and study in Fairfield County, CT and have a continuing involvement with the German School of Connecticut (GSC) in Stamford. These accomplished young women are extraordinary representatives of the rich German-American heritage and culture of the tri-state area. Princess Sean Tomlinson, from Scranton, PA, i s a double major of German and Sociology/Anthropology at Fairfield University, Class of 2019. Sean is an active community activist and aspiring folklorist. She learned German beginning in high school and was able to explore her German heritage in depth during the Summer of 2016 when she worked at a family clinic in Southern Germany. Now she shares and celebrates her culture as a German teacher for beginning students. Sean has taught German at Yale's Sprout and Splash Programs, at Starfish International in The Gambia, and as a teaching assistant at the German School of Connecticut. We are looking for teachers, see details above. 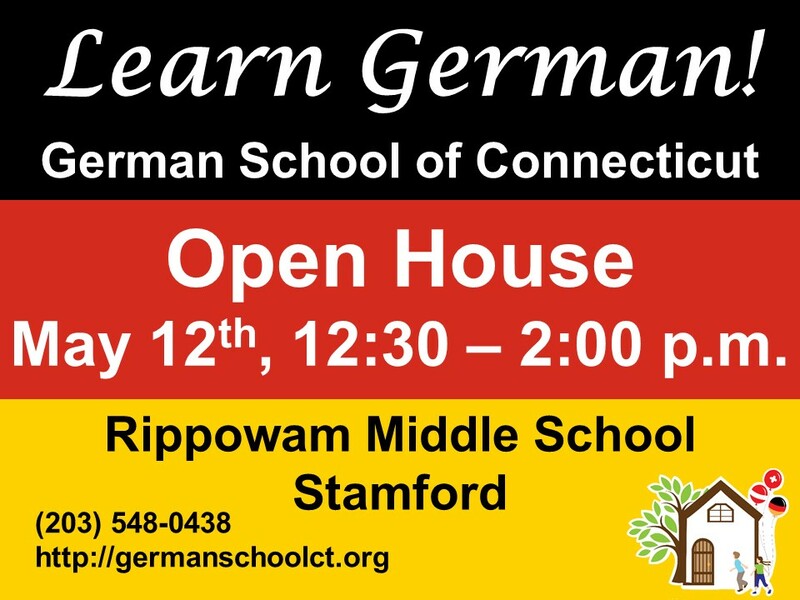 Do you like to volunteer for or donate to the German School of Connecticut? All of our parents community and some of the adult students are volunteering at our schools in Stamford and West Hartford. Thank you very much. But we are also looking for outside volunteers to help us organize events or Saturday mornings. Maybe you have a special talent like playing an instrument, fundraising ideas and experience, website talent or any other ideas to help us thrive in Stamford or West Hartford. We also wanted to let you know we accept any donations in form of books, computers etc and also money donations. Any donation is fully tax deductible and you will receive a receipt by mail for you tax filing. Today, 40 years ago (22 May 1978) I signed the papers of incorporation of our school. Thus, today, 22 June 2018, is our 40th birthday. Last Saturday, with the help of the administration, parent volunteers, teachers and students who created a time line, an exhibition of their school work as well as a GSC hymn, we pre-celebrated this birthday. We had a lovely school event. The Consul General in New York who could not be present last Saturday asked me to let everyone have his congratulation. I attach it. I also attach an article on the history of our school that was written by a freelance journalist who has written about our school before. I thank you all for your great and dedicated support of the school in the many years since its creation. I wish you a wonderful summer. For the upcoming fall and spring semester we wanted to make you are aware on how we would communicate school delays or closings. We will email you with this website and/or manually (and for those who have their accounts set to receive text messages, will receive text-messages from this website) about any school closings or delays. Also we would send you the automatic alert that you receive weekly on Thursdays immediately when we would change anything not according to preset schedule. Teach a child German and .... their world broadens. They will be able to converse not only with German speaking family and friends but also with the 175 to 200 million other native speakers. Our Annual Fund campaign is now underway. The GSC offers students a path to language fluency and an understanding of German culture. Over the past 40 years we have had hundreds of students pass the Sprachdiplom, the most advanced exam for German-language learners. We keep our classes small to ensure that all our students get the attention that they need. Our goal is to keep tuition accessible to our families despite continuously rising costs. Tuition and support from Germany contribute to meeting our budget, but we count on our annual fundraising campaign to close the gap. This is where you step in and help: donate online or see our Annual Fund Appeal for additional ways to give. This weekend’s Steuben Parade is the first highlight of the new school year. Join us this Saturday parading up Fifth Avenue in Manhattan. Our Float will assemble on East 70th between Park and Madison Avenue as part of the 7th Division. You can view the full parade line-up here. Meeting time is around 12:00 noon. Don't forget to bring water and a snack, as it always takes a while until we start moving. We will have Gummibärchen and GSC business cards to hand out along the parade route. Please wear a GSC T-Shirt or something typical German. A big Thank You to the Literary Society Foundation for sponsoring the GSC float. What to do after the parade? The beer garden has Oktoberfest weekend with music, special draft beers and Bavarian-inspired foods. There will be enough space for the younger ones to play and run around. For anybody traveling back from Manhattan on the train, as the bulk of our group arrives in Stamford, we will arrange for transportation from Stamford Station to Shippan Point.